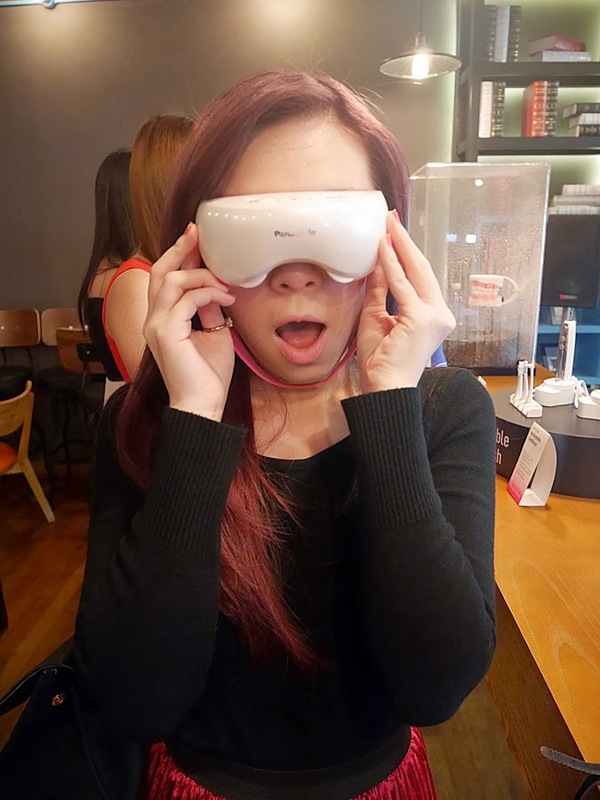 JQ Talks: A Morning Well Spent At Panasonic Beauty Cafe! It was certainly an interesting morning. Being welcomed to a beauty cafe was definitely something I can get used to. It wasn't just the coffee, it was the excitement of being surrounded by so many stylish gadgets that were designed to make women's busy lifestyle a lot easier. The Panasonic Beauty concept is all about convenience and easy-to-use. For a contemporary savvy working lady like me who constantly need to look good, a little help from our friendly technology to achieve my best look in a short period of time is something I can't say no to. Check the wall of Panasonic Beauty gadgets *Squeeek* Covering four different areas from Hair Care, Face Care, Body Care and Mobile Beauty. Each range provides a unique and advanced experience while keeping it stylish in design and innovative in Panasonic's nanoe technology. They've also prepared four stations for us to have a hands-on demonstration. Check out some of the gadgets that I've tried. 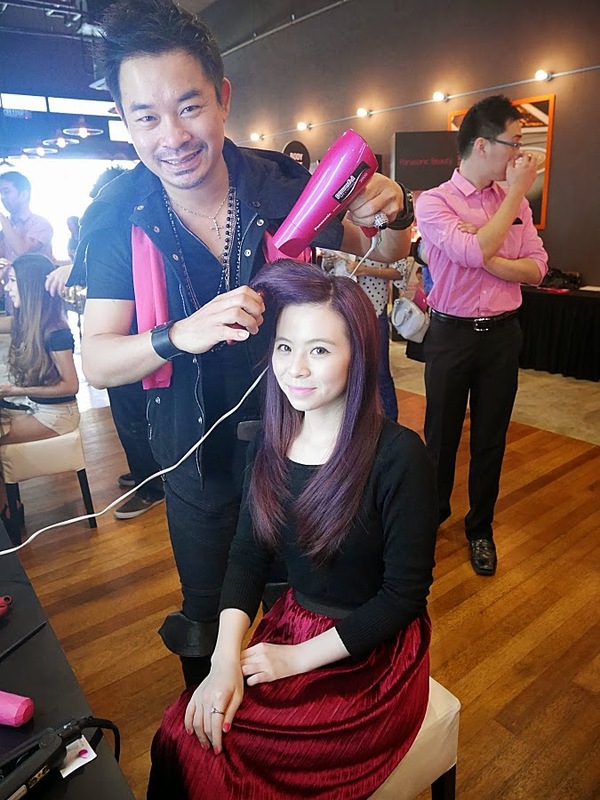 I was lucky to meet Sebastian Tan, a Professional Hair Stylist and Art Director to introduce some of the hair tools that he felt suitable to my current hair condition and lifestyle. As most of you already know, I'm currently a freelance travel editor and full time blogger. Thus, part of my job requires me to travel quite a bit. 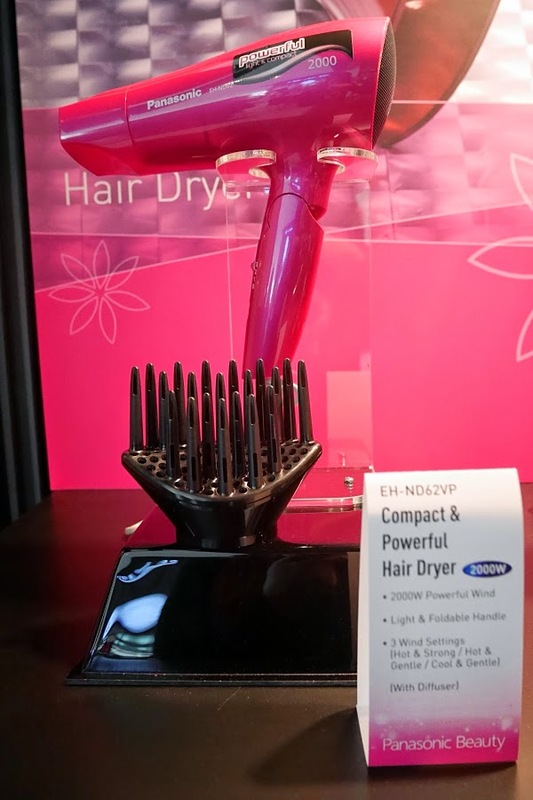 So it was nice to know more about Panasonic EH-ND62, a compact yet powerful hair dryer that's also so utterly pretty in pink. It's a great travel companion because it's foldable which can help you to save luggage space, and super light as compared to other hair dryer. It also has a powerful wind of 2000w but comes in three wind settings for us to adjust according to our preference. In addition, for those with permed hair, you can get the model that comes with a diffuser to maintain your curls at home. Even if I don't use it for travelling, I like this hair dryer because I realise that my arms don't get tired so easily when I blow dry my enormous amount of hair. I'm sure those with thick hair will understand what I mean. Girls with thick, long hair like mine requires more effort and takes a longer time to style our hair. Many times, I'll get extremely pumped up doing one side of my head and then complaining miserably how tired my right arm is holding the hair dryer while trying to complete the other side of the head. Sounds familiar? Well then, you will appreciate this light-weight hair dryer. Other than that, I also find this Panasonic nanoe Hair Straightener EH-HS95 to be absolutely delightful. This innovative tool not only produce glossy finish to my hair but also helps maintain hair moisture as well as hair colour. All these thanks to the built-in nanoe technology. This station comes with all extensive "on-the-go" tools such as portable shavers, toothbrush (Doltz) and etc. I had the opportunity to test out the Panasonic Nail Care set (ES-WC20) which allows us to do filing, buffing polishing and basic cuticle care. This is extremely portable because it comes with four detachable heads, thus this means that you can get to save space by not needing to bring four separate tools just for a nice DIY manicure pretty much anywhere. The other mobile tool that I really do like is the Eyelash Curler (EH-SE60). I mean come on, look at how slim it is as compared to the regular lash curler. Seriously, most of the time, I have trouble zipping up my makeup bag all because of the irregular shape of the conventional eyelash curler. Plus, it's super easy to use. All you got to do is just wait about 20-30 seconds for the comb to warm up and on the comb for 360 rotation to curl your lashes. They even come with instructions for you to get the perfect lash look. Hello....... quiet epilator! Finally, an epilator that can be used wet or dry and most importantly, don't produce loud noises. The current one that I have now only allows me to use it dry and is as loud as a lawn mower. It comes in two models Panasonic Wet/Dry Epilator 6in1 (ES-WD94) and 2in1 (es-WD24). They show us a demo on how this smart tool creates foam easily for a gentler hair removal process as well as it comes with LED illumination. Besides that, it also has a skin protector sides to hold skin in place so the epilator pulls only the hair and not the skin, making the process less painful and longer lasting finish. LOVEEEEE. The product on demo was the Panasonic nanocare Facial Ionic Steamer (EH-SA31) which produces nao-ionic steam that penetrates into the skin for deep moisture retention. They suggest to use this as a makeup primer for makeup to last longer as well as deep cleansing for the steam helps open up the pores which makes it easier to remove makeup. Pretty cool. Besides that, several other products that will be coming soon to Malaysia were also displayed including Scalp Massager, Eye Warming Massager, Thermal Esthetic Roller, Oral Irrigator and Rechargeable Toothbrush. For me, I'm mainly waiting for the Scalp Massager and Eye Warming Massager to arrive because they are just sooooo amazing. Sneak peak on the Eye Warming Massager! 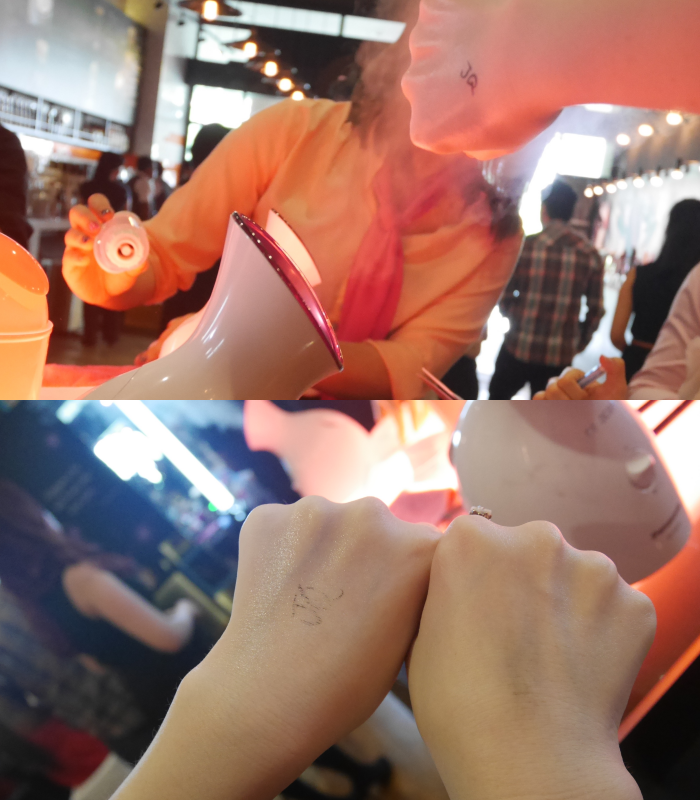 I had the most amazing time playing and testing all the Panasonic Beauty gadgets. Plus, I've made some cool friends too! Thanks Panasonic for the lovely morning!